Do you love delicious snacks? We at Inspire Me Korea certainly do! Here are a list of tasty Korean snacks which you may not have encountered before, so why not give them a try! Image source:© Banana milk. BEL920617. 25.10.2016. BEL920617 wordpress. 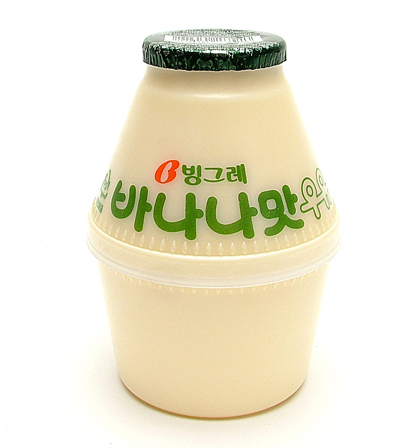 A famous staple drink in South Korea is banana flavoured milk! You may even have noticed it cropping up in Korean dramas. Binggrae is the most popular brand selling banana flavoured milk (with ‘original’ and ‘light’ versions), conjuring up memories of nostalgia for many who grew up drinking it. There are alternatives if banana isn’t your flavour, like strawberry and melon flavours! 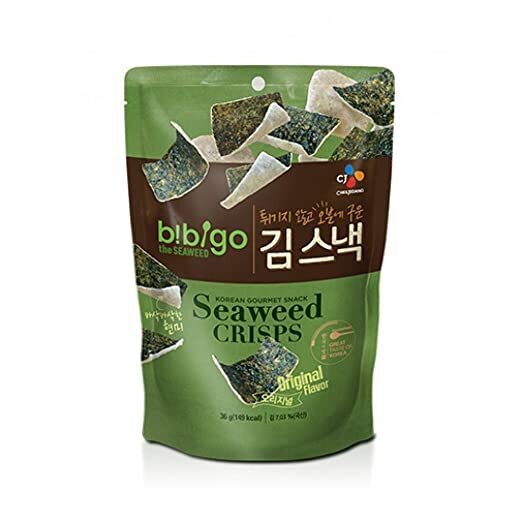 Image source: © Korean Bibigo Original Baked Seaweed Crisps. Bibigo. 25.10.2016. Amazon website. Seaweed crisps are very moreish and addictive! Satisfy your savoury cravings by tucking into some of these baked crisps, made from seaweed and brown rice. Get the Bibigo seaweed crisps in our limited edition September CHUSEOK box! Image source: © Calbee honey butter chip. Haetae Confectionery & Foods. 25.10.2016. Honey butter chips remain a very popular snack in South Korea, so much so that the term ‘honey-butter craze’ was coined! An addictive snack, with a taste that is similar to popcorn, is the perfect combination of sweet and savoury. Image source: © Haitai Sindangdong Tteokbokki. Haitai Confectionery & Foods. 25.10.2016. These chips taste like spicy tteokbokki, complete with crunchy texture. 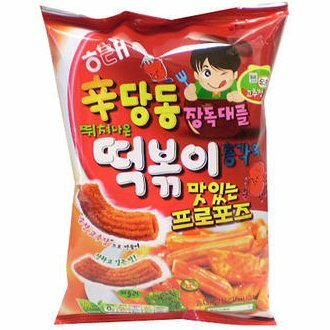 Slightly sweet, with a kick of heat at the end, give them a try if you intrigued about tteokbokki in the form of snacking chips! Image source: © Green tea milk spread. OSULLOC. 25.10.2016. coreainthai website. This matcha green tea milk spread can be paired with bread, crackers, scones, waffles…whatever takes your fancy! Smooth and creamy, with a hint of sweetness to match the bitterness of the tea. A product of O’Sulloc Tea House on Jeju Island, made from hand-picked tea leaves. Add a gourmet touch to your snacking with this tasty spread! Image source: © Choco cookie Pepero. LOTTE. 25.10.2016. KTOWN4U website. Image source: © Orion Yegam baked potato chips. Photo credits to koreadepart.com. 25.10.2016. These baked potato chips are thin and crispy, and available in original, cheese gratin and onion flavours. Considered as a sweet snack or a dessert to be enjoyed alongside a cup of tea, the traditional Yakgwa is flavoured with honey, and as such was historically thought to be good for health. Pressed into decorative flower moulds, these dainty chewy biscuits are beautiful to look at and to eat! Look out for these in South Korea or even have a go at making your own. Image source: © Churros. CROWN. 25.10.2016. The shopandbox blog. 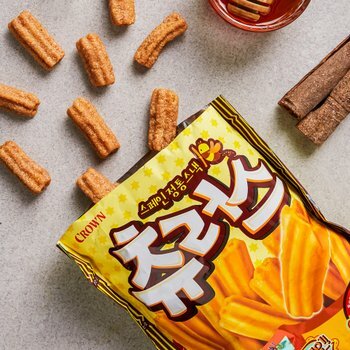 Churros are another food trend taking Korea by storm! Freshly made churros is hard to beat, but a snack version flavoured with cinnamon and honey sounds like yummy alternative. These delicious sweet pudding pots come in a range of interesting flavours: milk and egg, caramel, cream and custard, mmm we’re salivating just talking about it! Find out which is your favourite by tasting them all! Like Korean snacks? Subscribe to our Culture Box to get not only a variety of popular delicious Korean snacks but also specially curated Korean beauty, Kpop/culture merchandise and collectibles AND a monthly magazine jam packed with interviews, trends, recipes and what’s hot in Korea right now! Get the Inspire Me Korea Culture Box here and start being inspired. Featured image source: Benson Hua. 03.02.2017. Benson Hua Flickr.